Keeping up with the various social media networks can become an overwhelming task for any person, especially if you happen to be British singer-songwriter, Ed Sheeran. According to an Instagram post on December 13, Sheeran decided to take a break from social media in order to travel the world and “see” everything he’s missed while viewing it through a screen rather than, as he says, his eyes. If this year’s Best of 2015 lists are any indication of just how involved celebrities have become in their social media presences, it’s understandable that a break from the screen might be necessary once in a while. The majority of Twitter’s Top Trends and Most Retweets included celebrities and musicians. Whether Twitter, Facebook, or Instagram, celebrities and musicians are increasingly becoming driving forces, attracting millions of fans and followers. 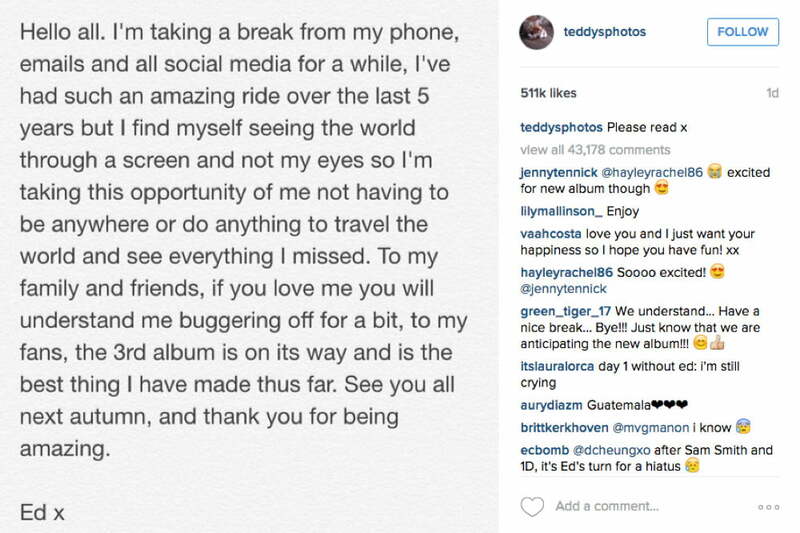 Sheeran shares his photos and life-experiences with nearly 6 million fans just on Instagram alone. In the past, celebrities needing a breather from social media have included Nicki Minaj, Demi Moore, and Miley Cyrus, who have all temporarily stepped away for varying reasons. And, other social media stars such as Lena Dunham and Essena O’Neil have decided to quit certain platforms entirely. However, there is hope for Sheeran’s heartbroken fans as he hasn’t yet mentioned a permanent retreat from social media.